I promised a hexagon sewing tutorial quite awhile ago. This is just the way that I sew my hexagons; it's not the only way. In a lot of cases I try to play mind games with myself when sewing. An example is when I'm hand sewing binding. I start close to a corner, so after I turn that first corner I feel like I'm a quarter of the way finished. I know that's not true, but if you can trick yourself into thinking you are closer to the finish than you really are, you get more of a sense of accomplishment and don't feel discouraged at trying to complete the task you are working on. (or at least that's the way I feel). Hexagons do take awile to sew together, but it's like anything else --- the more you do, the faster you get. 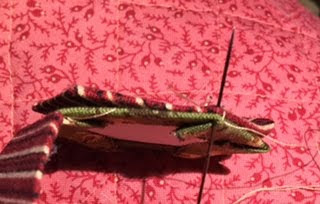 (1) Take a whip stitch at the corners folding one corner over as you are stitching. (photo below). (3) Glue basting using the Sew Line glue pen. This has become very popular and is my choice for basting paper pieces right now. You simply baste your hexagon shape over the paper piece using a light line of glue. Be sure to put the glue on the paper and keep it away from the edge where the fabric is folded over. That way you are not trying to stitch your hexagons together through the dried glue. These glue pens and refills are sold at most quilt shops. I buy mine at Back Door Quilts. The first thing I do is sew my hexagons into pairs. That is pretty mindless sewing that you can do while talking or watching TV. I just put two sides together and stitch. The only time you have to watch the orientation of the hexagons is if you are sewing fussy cut hexagons. 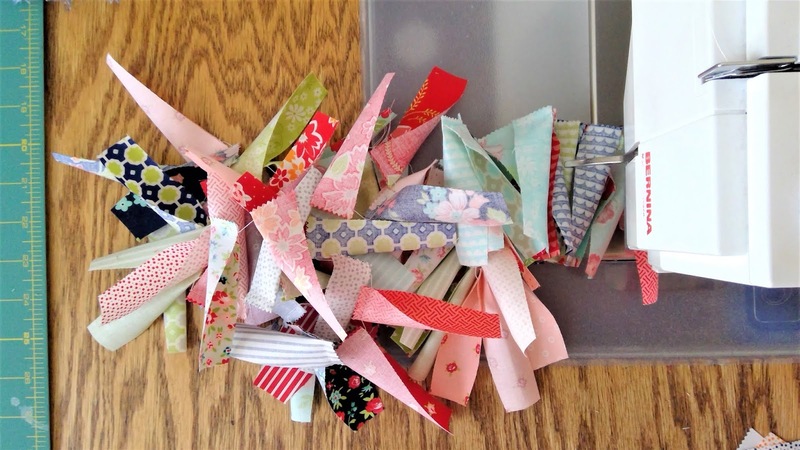 You can read my Fussy Cutting Tutorial here. The link can also be found under my blog header. Sewing hexagons into pairs is part of my mind game. Once they are in pairs, the whole hexagon comes together pretty quickly. Here are my pairs of hexagons. To sew these hexagons together, I first put the two hexagons right sides together and take 2 or 3 stitches. Then I sew using a flat ladder stitch (photo below) to finish sewing. This helps to hide your stitches on the right side of the hexagon. Next I sew the pairs into hexagon rings. (I sew the six hexagons together leaving an opening to form a ring as shown below.) The arrow shows the opening. I have a box full of her hexagons that I need to put together. 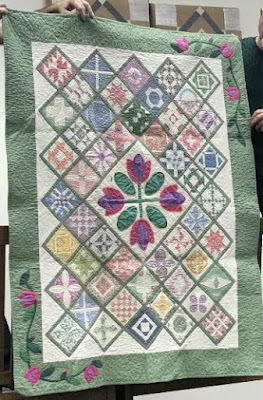 You can see that she has cut enough hexagons for a block and held them together with a thread knotted at one end and then a stitch through the stack. 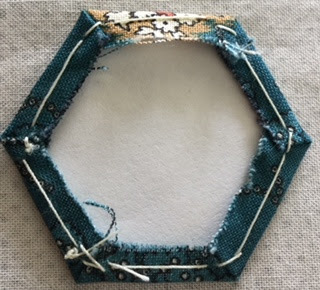 I sew my hexagons this way because I can thread the needle once and sew the center into the hexagon ring with this one thread. Start sewing at the start arrow and go around the center ending by sewing the last two pieces together by sewing your way out of the hexagon ring. Here are some of the hexagons that I've fussy cut. The hexagons in the above photo were cut from the fabric shown below. I keep a container like the one below full of 1" bright hexagons that are basted. I also have a container of 1" reproduction fabric hexagons and a third container of 3/4" reproduction fabric hexagons. 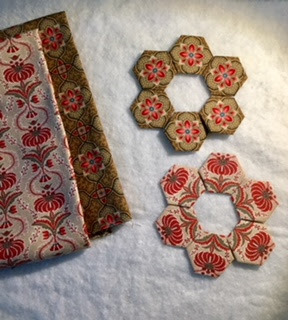 Below are several photos of 3/4" hexagons that are fussy cut from reproduction fabrics. 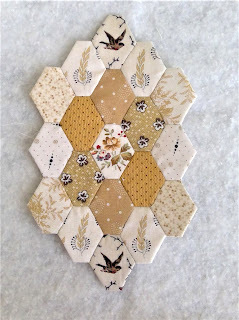 When you have a few hexagons sewn into flowers, you can either join them together with a background fabric (a path), or you can hand or machine applique' them onto a background fabric. 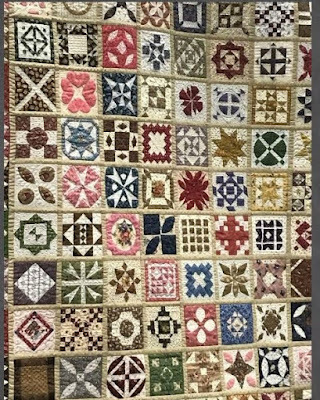 I've done quilts both ways. 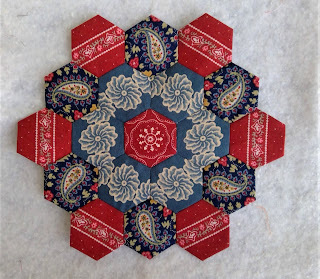 If the repeat in a fabric is like the one below - kind of a tossed flower pattern - I will take one hexagon that I've fussy cut and place it on the same flower in the fabric and trace around it. That way you are sure to always get the exact same shape in each hexagon. 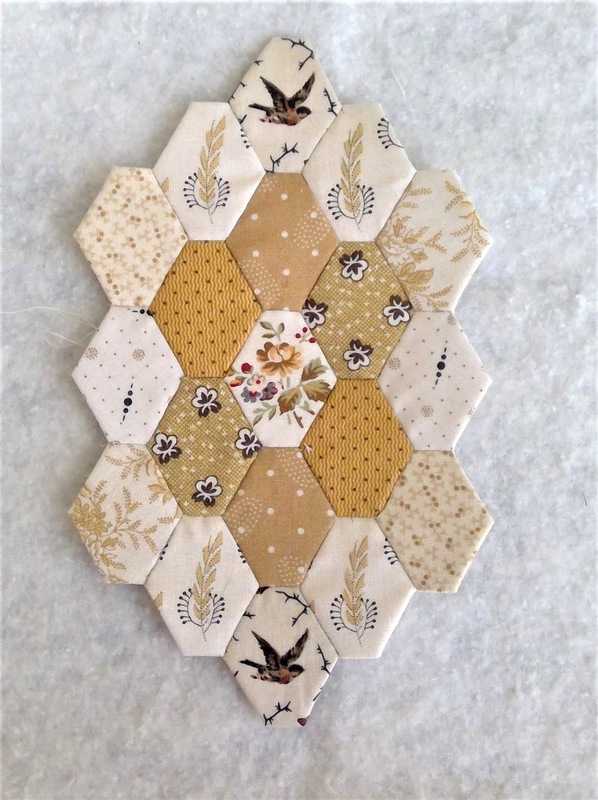 Happy Hexagon Sewing and English paper piecing. If you haven't already tried English paper piecing, I hope you will give it a try. If you have any questions, email me or leave a comment. You are probably tired of coming to my blog and seeing hexagons. Honestly, I'm running out of titles to use on my blog. 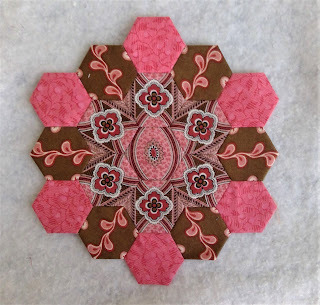 I never tire of looking at hexagon blocks or quilts with hexagons. I seem to always have a hexagon project of some kind on the go all the tine. 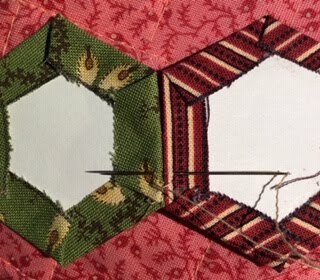 These double hexagons below are part of a plan that I have for a quilt. I think once I have enough hexagons (right now I'm not sure what that number is), I plan to add a plain border that is off white and then do some broderie perse. Right now I'm planning to do the border applique' on opposite corners of the quilt. 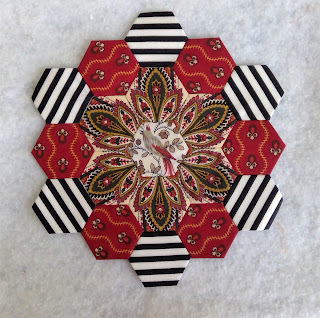 Some of these hexagons are left over from my Road 66 quilt (pattern in Di Ford's Primarily Quilts first book). 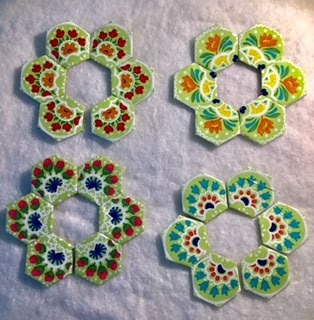 I cut 6 hexagons at a time - usually fussy cut - and put them in a tote for later. I have a good sized stash of basted hexagons. Here is my finished Road 66 quilt. I love doing these double hexagons. Each one is a surprise. 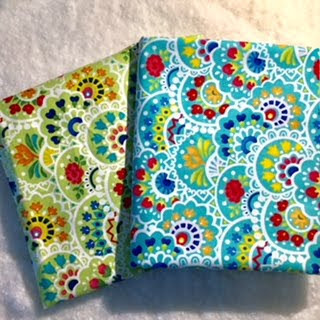 I think this is my favorite with the Di Ford and Jo Morton fabrics. I also like using stripes. 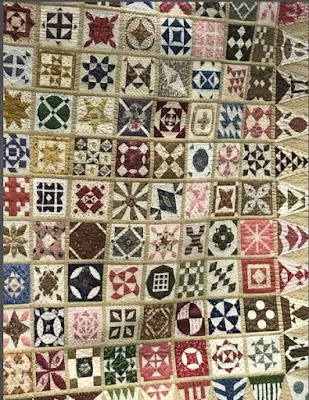 This is my 1797 Revisited quilt so far. I posted about it in this post. And, like I wrote in the post, I think I'll continue with this smaller size. I'm also chain stitching some Dresdens. These are cut at 3 1/2". More on those later. For those of you here in the US, this is a Public Service Announcement. Have you renewed your driver's license lately? In order to be cleared to fly or enter some federal agencies, you have to have a Real ID driver's license with a special symbol. This goes into effect in October 2020 for all states so there's time.....Well maybe not. You have to prove who you are. The males have a pretty easy time of it. They have the name that they were born with (hopefully), so all they need is their birth certificate and social security card plus 2 documents that prove residency. And those residency documents have to have a date that is 60 days or less. A passport will cover some of this if you have one. So that all sounds pretty simple, right? Well, not really. For females that are married, and/or divorced, you have to have your marriage license and/or a divorce decree. The marriage license has to be one that has the embossed seal. Ask me how I know this...….. I've been there 4 times, and today I finally had it all right and will have my new license mailed to me. My first trip I had my birth certificate and social security card. My birth certificate didn't match my married name. I should have known that. Trip #2 I had my marriage license, but it wasn't the embossed copy. So I made the trek downtown to get that. That was enough for that day. Trip #3 I had my birth certificate, social security card, and embossed marriage license, but all of my documents (including my old license) have LuAnn all together as one word. I guess technically Ann is my middle name, but everybody calls me LuAnn. That time they just told me everything didn't match. So today I went back to a different branch (with current documents that provide residency), and I made it. I was beginning to panic because my birthday is at the end of this month, and my license would have expired. This is probably more than you wanted to know. Some states have probably already gone through this. But if you show up at the license branch and aren't aware of this, that is just the first trip. And, you have to keep getting documents and going back until you get it right. OK. Now back to stitching. I hope that you are finding some time to stitch today. First of all, I want to apologize for the post that went out yesterday if you subscribe by email or just happened to look at my blog. I had the post written, and it was in my drafts folder. Then I added and changed a few things and hit the publish button. When I went to look at it on line, I noticed that it already had 11 comments. I had posted that same post about a year ago, but somehow it was back in my drafts folder. I'm not sure how that happened. I take photos with either my iPhone or iPad and then email them to my blog where they save as a draft post. I intend to get back in here and write something to go along with the photos and then post. That doesn't always happen, and that's how I ended up with 57 posts in my Drafts folder. I've cleaned that out only kept a few things that I really want to post. 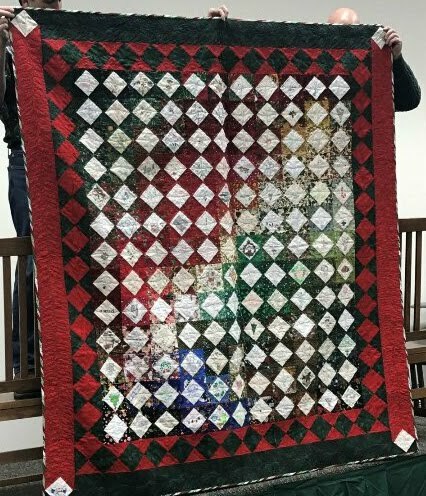 Last November we celebrated our 20th year getting together for the Jane Stickle Quilt Retreat up in Shipshewana. I have only been going 18 of those years, but I've made friendships that will last a lifetime. We had a very large crowd last November (I think around 130), so we had a separate night for just Dear Jane show and tell. My Dear Jane quilt. There are 169 blocks that finish at 4 1/2, 52 triangles and 4 corners. 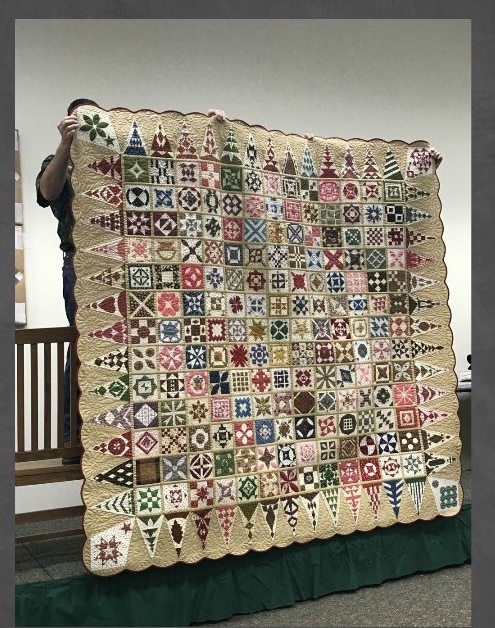 I worked on this quilt off and on for about 10 years. I had it long arm quilted. 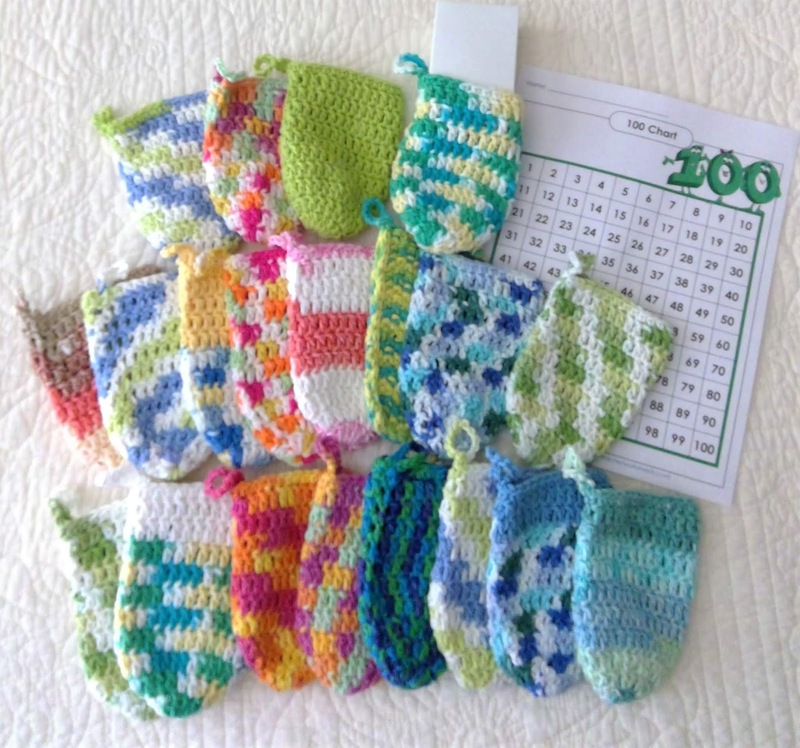 There was an internet Dear Jane list, and we had a signature block swap. Some of the blocks have hand sewn beads and buttons and embroidery. 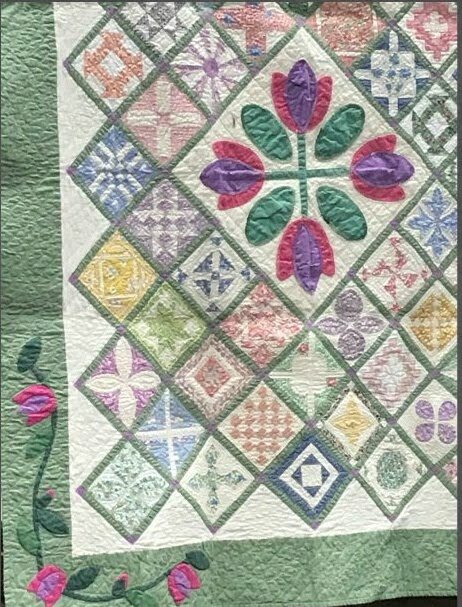 The blocks in this quilt are from a Spring Fling swap. 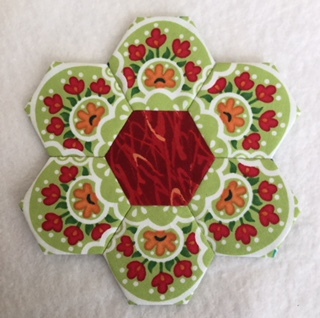 I bought the center applique block at Rebeccar Harrer Arts and Antiques in Shipshewana. When I first became part of the Dear Jane list and retreat, whenever someone said the word swap, I asked where I should sign up. 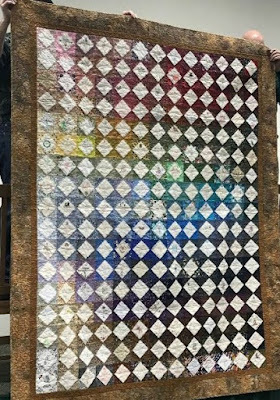 This quilt is made up of swap blocks from some of the girls that come to the retreat. 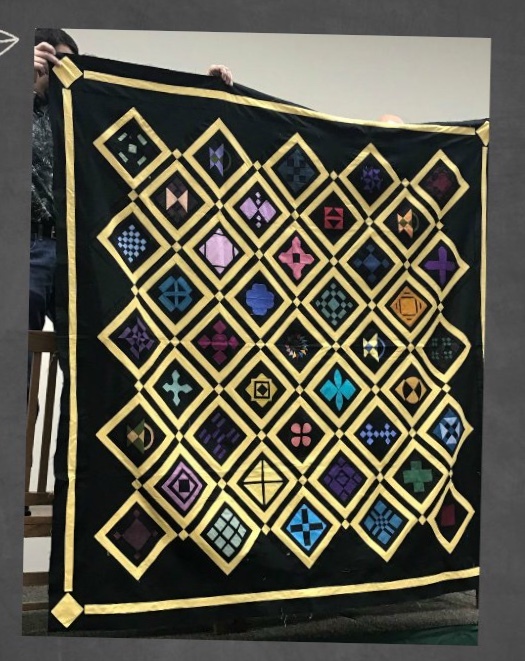 I'm not sure what I was thinking with that bright yellow sashing, but it definitely brightened up all of the dark blocks. 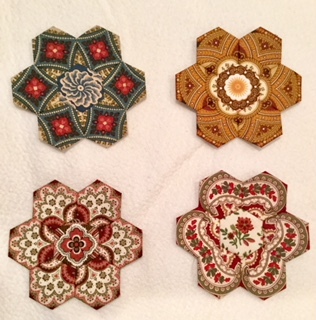 These blocks are from a Christmas Jane swap. 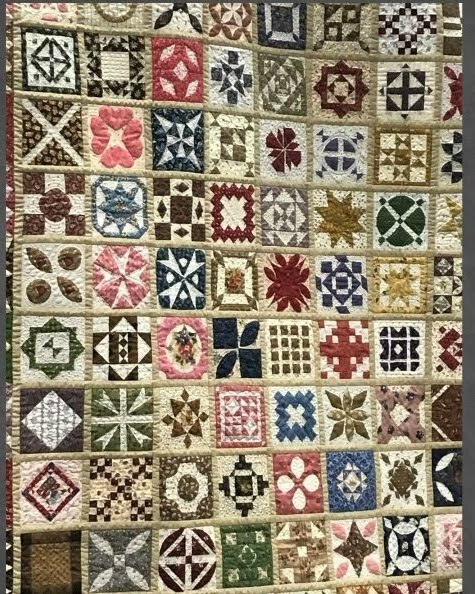 All of the blocks in these quilts are taken from the Dear Jane book. 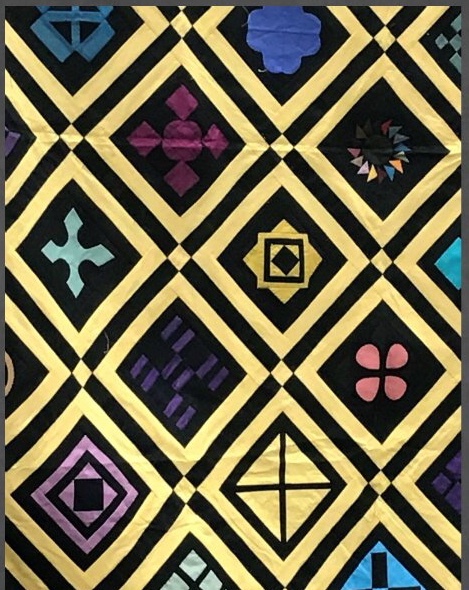 The feathered star in the center of this quilt was a block that I made for a round robin I was in. I think I changed my mind on the fabrics for the round robin and used the feathered star for the center of this quilt. At some point, a second Dear Jane list formed. I'm not sure now what the reason was for that. But, I signed up for this list, too. 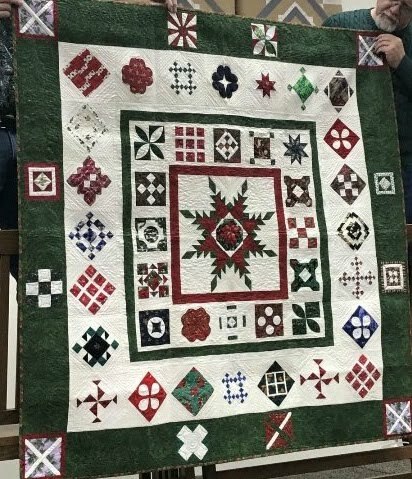 They had a Christmas signature swap, and this is the quilt I made. 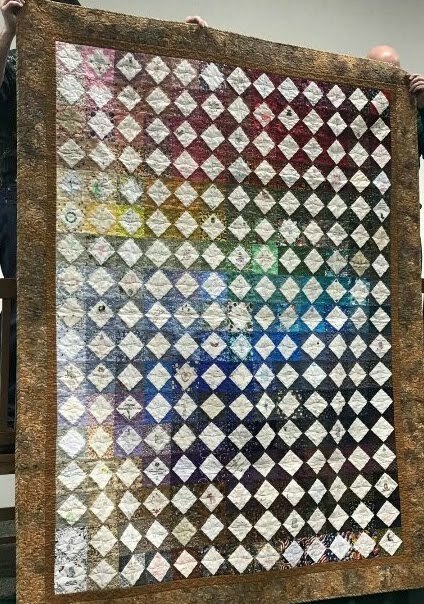 I love arranging the signature blocks in a colorwash pattern. All of the blocks have Christmas fabric on the corners. I've made enough swap blocks that I could have made a second Dear Jane quilt. There are some in our group that have made 5 or 6 Dear Janes. I've thought about making a second smaller quilt. I think there is kind of a withdrawal when you finish a huge project like this. After this I moved on to the Nearly Insane quilt and finished it. 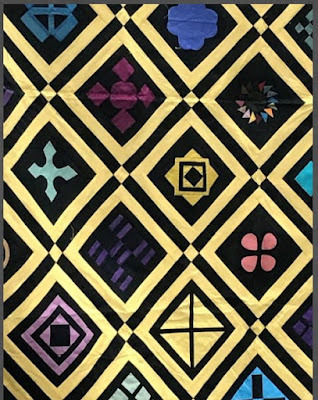 You can see that quilt by looking under my header at the My Quilts tab. I'm not sure where the year has gone. It is mid February already, and January is a blur. 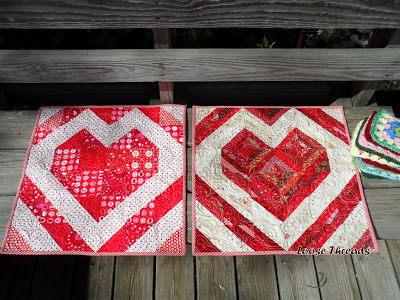 I'm getting ready to put my Valentine's quilts and table topper away for the year and thought I'd share them with you. 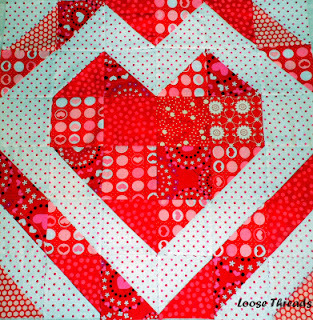 This is my Valentine String quilt. 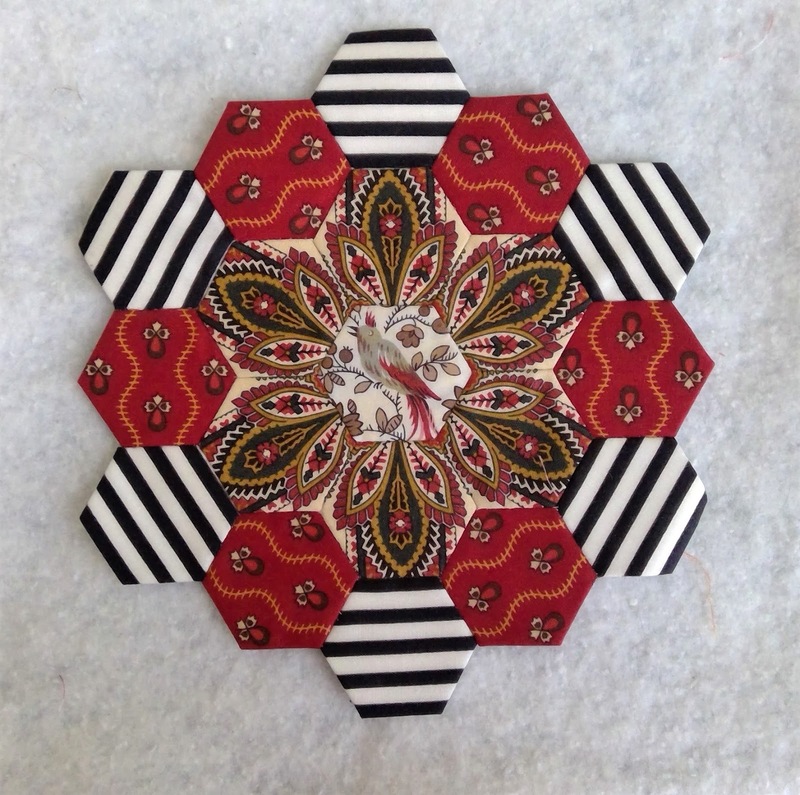 I just made this one day while I was making string blocks out of my red and white scraps. You can read more about this quilt and see my EQ drawing here. 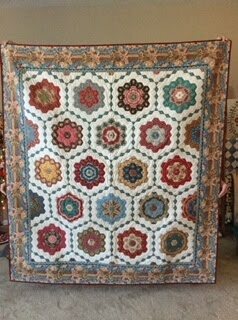 Here is the quilt after being quilted by my long arm quilter. 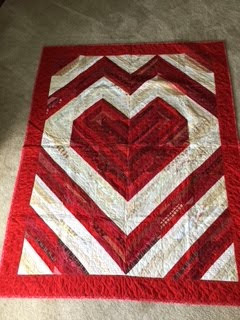 He quilted a heart design that I just love. 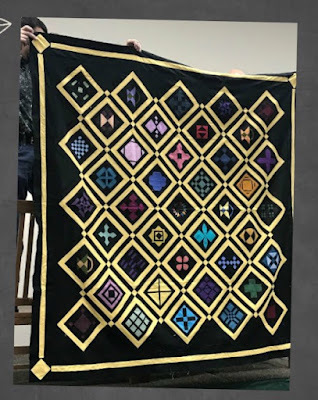 This is a smaller version of the quilt above. This one has 3 inch string blocks. You will read more about these in the link above. Here is a link to my tutorial for making the heart string blocks in both the large heart quilt and the smaller one. 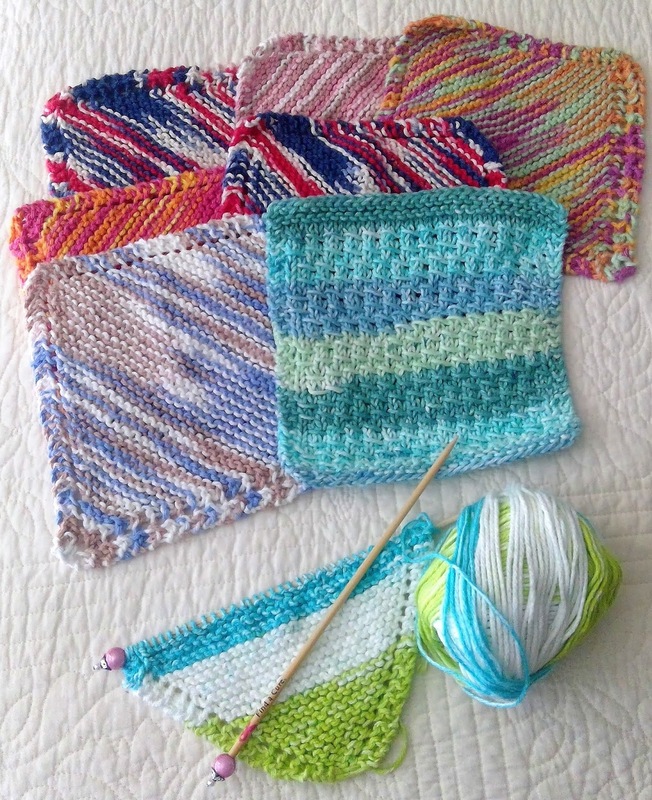 If you don't enjoy making string blocks, you can achieve the same look with squares and half square triangles. You can see my EQ drawing with this layout in my post here. You can see the two versions side by side. They look pretty much the same. 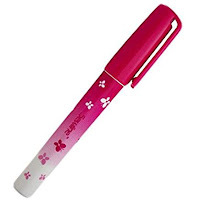 The next two photos are of my patterns. The first one is Sunburst Dresden Table Topper. I have one of these table toppers for every holiday. It is a quilt as you go pattern and is pretty easy. The patterns are available in my Etsy shop here. 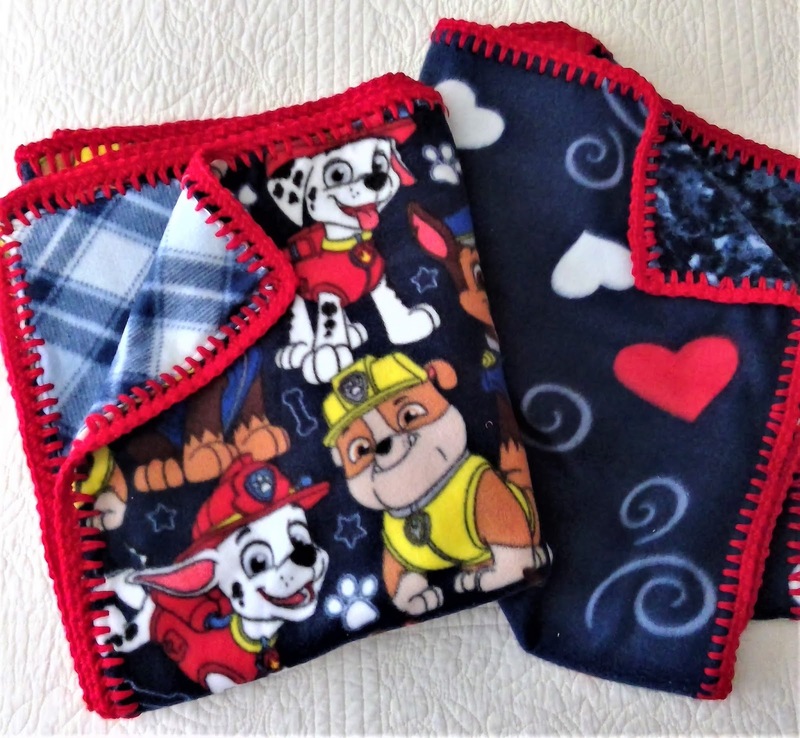 They are also available at Back Door Quilts either in their shop or on their web site. 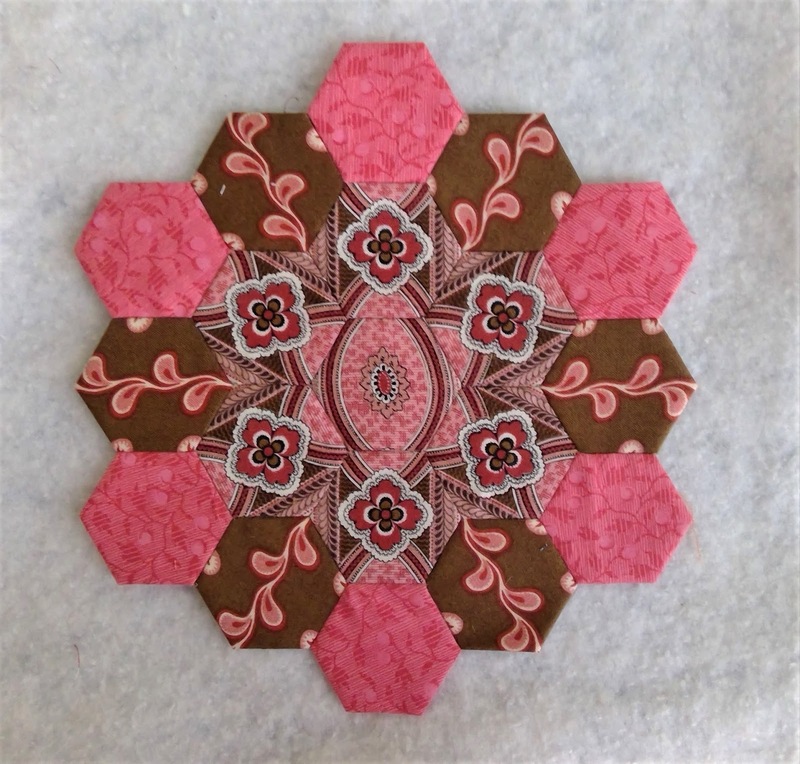 This pattern is called Hexie Love. Directions are included to either add a hanging sleeve to be hung on the wire table hanger as shown, or it can be made into a little quilt. This is English Paper Piecing and broderie perse. The heart is done in EPP using quarter circles. I'm not sure how this quilt will end up, but I loved doing the hand stitching on it so far. I had a wonderful Valentines. My hubby got me a dozen roses, but I forgot to take a photo before they started to wilt. I love each and every one of you that are taking the time to read my blog. Happy Belated Valentine's Day to you!!!!!! We are just coming out of the Polar Vortex. Schools here were closed both Wednesday and Thursday, and at one point our temperature was -10 degrees, and the wind chill was -41 degrees. I just trusted the weather forecasters that this was bone chilling cold, and I stayed inside. It's a bit warmer today, and we had some snow overnight. It's not enough to completely cover the grass. Before spring, I would just like one huge dump of snow. And, I would like for it to snow during the day so I can watch it pile up. I've stayed in and worked on some projects. This is the time of year when I'm very thankful that I have a warm home and all of the comforts that go with it. This house has a gas fireplace, so with a flip of a switch there is warm air filling the family room. I know there are many others that are not so fortunate. I've been spending days in my sewing room. 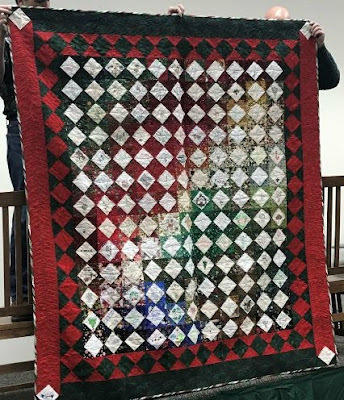 The photo below is quilts I've made to donate to Quilters United. 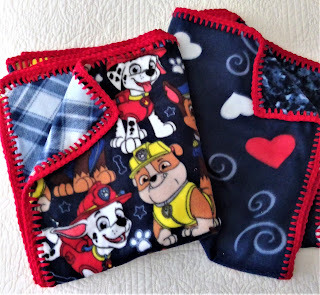 All of the quilts and items we make are donated to children. I had some of these tops made before, and some I just put together this week. Then I machine quilted all of them. Today I plan to finish the binding. 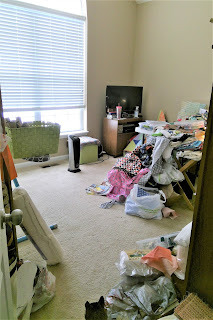 To be honest, this is the time of year I take a look at all of the fabric, yarn and other "stuff" I have here and wonder, "What was I thinking?" So I'm trying to use up some of what I have here. And, yes I've had to buy more fabric for backing and batting to finish some of these things. I guess it's two steps forward and one step back. 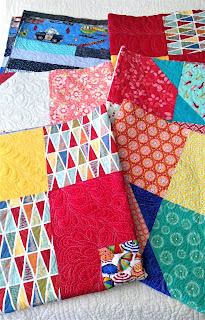 I'm backing most of my charity quilts with flannel, so in a lot of cases when I trim the quilt after it's quilted there is enough flannel and batting left for a burp cloth. I think this is 8 1/2 inches wide before it's sewn. 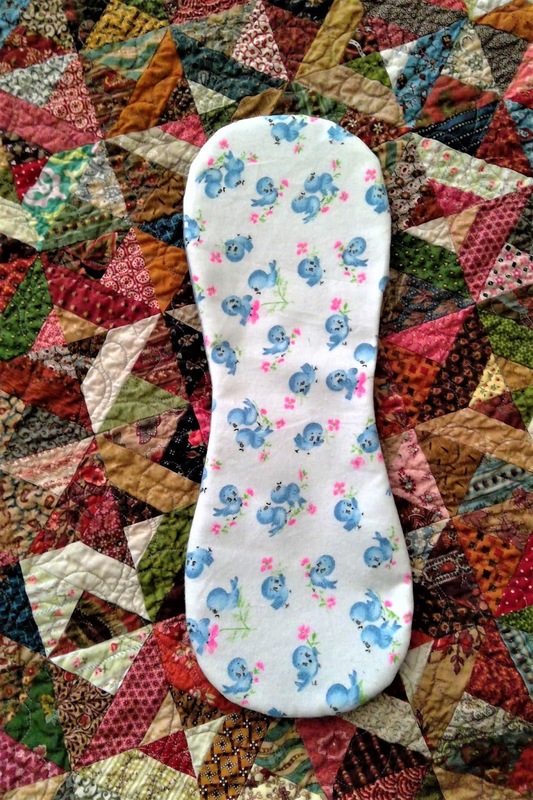 I had a half yard of wide blue flannel backing left from backing a quilt, so I bought this blue bird flannel. OK. I bought some pretty bright yellow solid flannel and some with yellow butterflies and flowers, too. We have a Quilters United sewing day once a month, and one of the girls had the Paw Patrol and heart fleece left over, so I brought it home to crochet around. Yep, I bought more fleece to put on the backs. Then these two pieces of fleece were in the remnants, so I bought them to make another blanket. 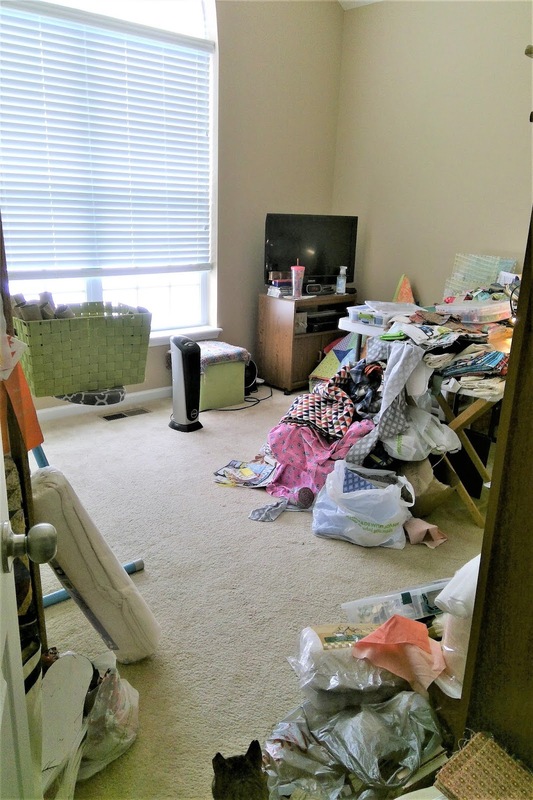 As I write this, I see that I just might be buying more than I'm using. To crochet around these, I have a skip stitch blade that fits in my rotary cutter. 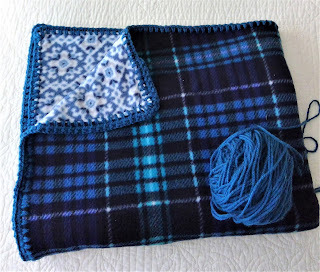 You just roll it around the edges of the fleece, and it makes tiny holes that are big enough to get a crochet hook into. Oh, I am using some yarn from my stash! I've also been spending a lot of time on some of the Farmhouse Decorating blogs and Instagram pages. There is just something that appeals to me about the neutral décor with the buffalo check and farmhouse accessories. 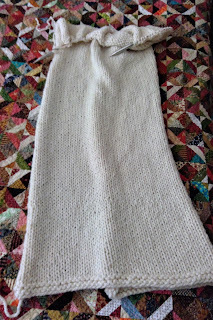 A lot of the photos show solid color knit blankets with big stitches. I think most of them are done with finger knitting, but I bought a size 19 knitting needle and have been knitting on this. This didn't come from my stash. I bought this yarn, and there is a box of a pretty seafoam color waiting in the wings. I also love to make knit dishcloths. This pattern is easily memorized, too. Cast on 4 stitches. K2, yarn over, knit across. Repeat until you have 40-44 stitches on the needle. Then: K1, K2 together, YO, K2 together until you have 4 stitches left on the needles. Bind off. Some of this yarn was what I bought for Soap Sacks. Naturally I had to buy enough to make both dishcloths and Soap Sacks. 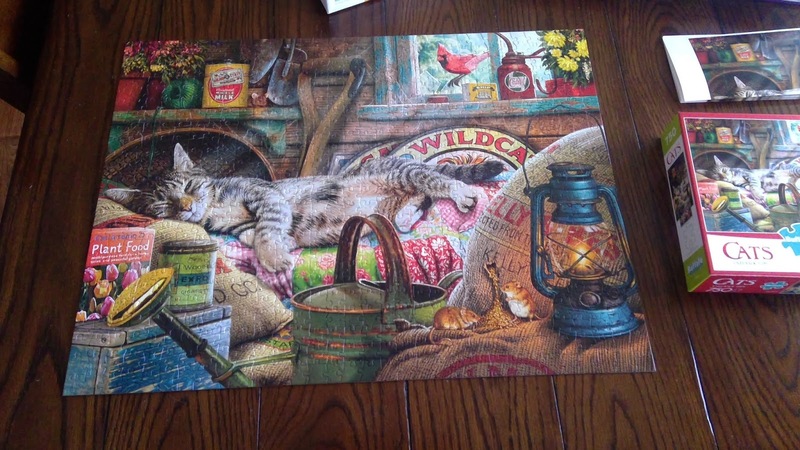 We also have a jigsaw puzzle in the works on one end of the table. This was the last one finished. I admit that I haven't put many pieces in (ok...maybe none) because I'd rather be stitching. 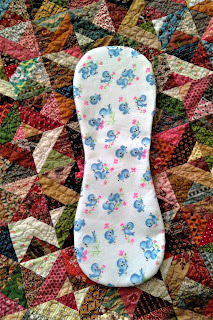 If you've read the entire post, I'll show you where I sew. It's a bit of a pit right now. The edge of the white table you can see in front of the TV is where my cutting mat is. 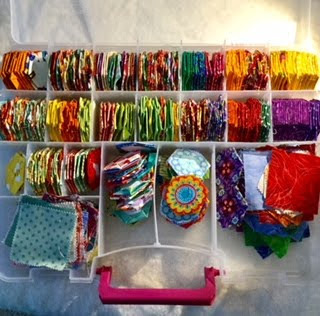 I've cut and just shoved the rest on the floor, but I know there is fabric in there that can be used for burp cloths. That table is full of strips cut for binding the quilts you saw in the first photo. There is also a couple containers of thread there to match the binding colors for top stitching. There is really no room for a table. There is a closet to the left with part of my stash. On the right is my bookcase and my machine is to the right of that facing the window. This is what should be our guest room, but I love the light that comes in that big window and the arch above it so I sew here. At the bottom of the photo, you can see Tiki our cat. He's not sure he wants to venture in. I'll post another photo when I've cleaned and sorted the piles. Right now there is more sewing to do. 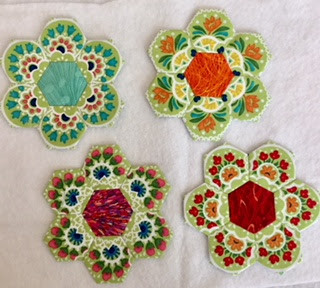 I'll post another photo when it's cleaned up (much later), and I'll post a photo of my UFO tops that need to be quilted.